This use case extends a base use case for fast-moving consumer goods (FMCG) that want to become “smart” via SmartTAG and TagItSmart. It combines novel solutions, and enabling technologies and tools to create smart solutions for the whole value chain; manufacturer, transportation, retail, consumer and recycling. To implement the use case, a real FMCG has been chosen. In this use case the beer and beer bottles are followed from the manufacturer until recycling the bottle at the end of the value chain. We are talking about “Digital beer” that can be modified to meet use case requirements which also can be used in piloting during TagItSmart project. The idea of this use case is to implement a system/technology that allows the lifecycle management of every fast-moving consumer good (FMCG), or consumer packaged good (CPG), that motivates and helps companies and citizens recycle their waste items, overcoming and solving current limitations and problems. The brand protection use case aims at providing brands and consumers with a mechanism to test authenticity of their products and reduce counterfeiting. 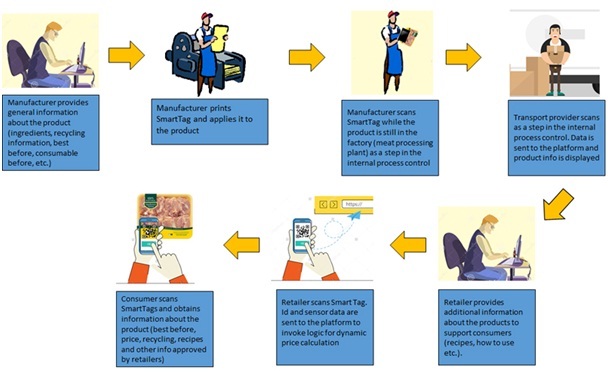 SmartTags and their capabilities to change based on environmental conditions (such as light, temperature) are used to first identify uniquely the item at hand and second to provide means to avoid fake or misplaced products, by enabling contextual scanning. Manufacturing first provide general information about the products (ingredients, recycling information, best before, consumable before, etc.) as well as reference thresholds for the type of the product. 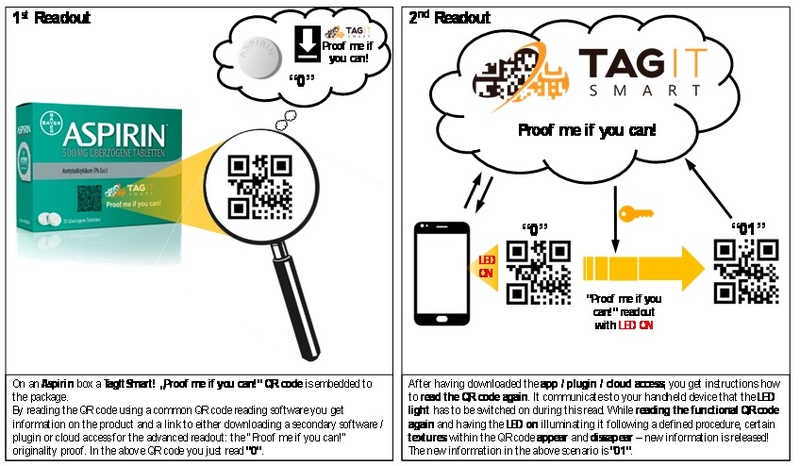 Then the SmartTag (ID) is encoded and SmartTag is printed and attached to the product package. As a part of internal process control, the manufacturer scans SmartTag while the product is still in the factory (meat processing plant). Then the product is ready for transport to the retailer. Afterwards, the transport provider scans SmartTag as a part of the process control. In retail, retailer provides additional information about the products to support consumers (recipes, how to use etc.). Availability of information defined: general or when scanned at selected locations only (in their shops). Then the retailer scans SmartTagas a part of “supply chain control process “. Scanning results (pack ID and result) are forwarded to platform and dynamic price calculation process is invoked. Consumer scans SmartTags using a smartphone application and obtains information about the product (best before, price, recycling, recipes and other info approved by retailers). The retrieved information depends on the location and time of scanning. A good usage of the heating equipment (e.g. a boiler and an associated filtering station) is one means to provide comfort and a healthy living at home. 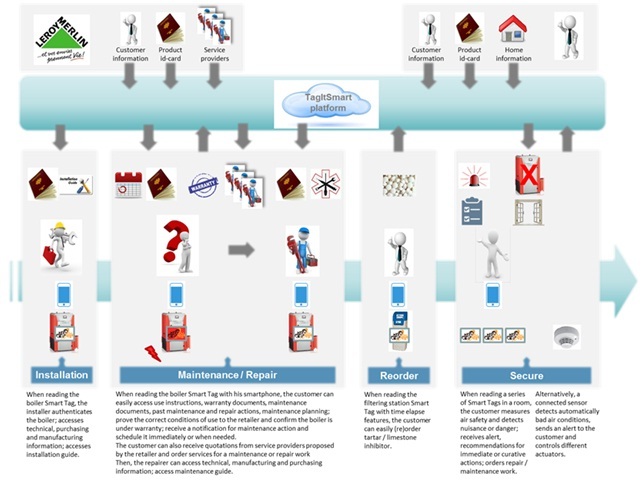 This implies proper 1)maintenance, 2) repair, 3) replenishment,and 4) monitoring.This use case will test different services to the customer all along the life of the equipment at home. Some of the services willleverage access to information related to the product, its environment and its use; and some will provide specialized services (installation, maintenance, repair, etc. ).